These biscuits are soft and fluffy. You’d never guess that they are made with whole grain flour. I usualy set up an assembly line and mix up several batches of the dry ingredients, package them in zip top bags, and store in the refrigerator. 1. Preheat convection oven to 500°. 2. In a large bowl, combine all dry ingredients. Cut in the coconut oil with a pastry cutter or 2 knives until the lard is the size of baby peas. With a fork, stir in all the buttermilk until just combined. 3. Turn the dough out onto a dusted work surface, dust the top with flour and pat out into about a 10 inch square. Fold the dough into thirds like a business envelope, then pat out again and repeat from the opposite direction. Pat and fold one more time, then pat out to a 1/2 inch thickness. 4. With a floured 2 1/2 inch cutter, press straight down without twisting to make 12 biscuits, re-forming the dough as necessary. 5. 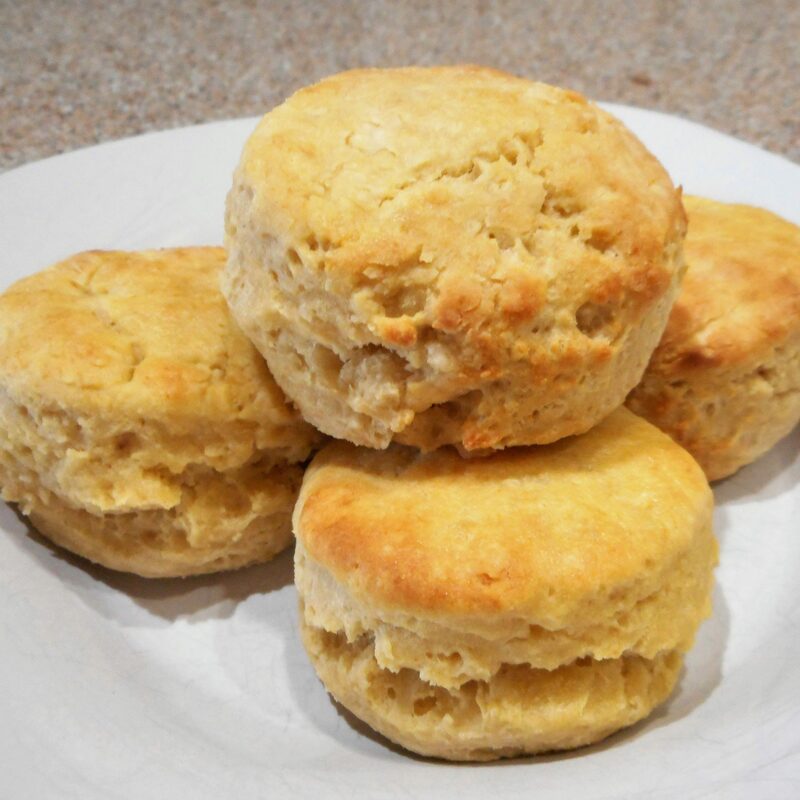 Place the biscuits on a baking sheet and bake for 6 minutes and 15 seconds. Remove immediately as soon as browned to your liking.